In her debut novel, Goodwood, singer songwriter Holly Throsby delivered an historical coming of age crime story set in the early 1990s in a little South Coast NSW town. Somewhere near Goodwood was another little town called Cedar Valley. Cedar Valley was further from the coast and down a winding road from the nearest major town and full of eccentric, non-threatening and curious residents. Some of the action in Goodwood hinged on its characters knowing about Ivan Milat, the notorious backpacker murderer who operated in the forests inland from the town. This book also revolves around a real-world event, an old Australian mystery called the Case of the Somerton Man. On 1 December 1948, a well dressed man sat himself down on a beach in Adelaide and died. The residents of Cedar Valley only slowly come to the realisation that a man who came to town, sat himself down in front of the curio store and died on 1 December 1993, is an exact copy of this case. On the same day as this mysterious event, Benita ‘Benny’ Moon comes into town. She has been invited to come and stay by an old friend of her mother. Benny did not know her mother who left her when she was a baby, returning sporadically for short periods before disappearing again. As Benny settles herself into the life of the town, she learns that her mother lived there too for a time in the 1970s and slowly comes to find out more about her. 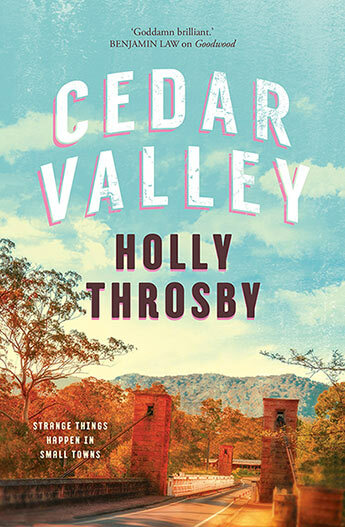 Cedar Valley is another gentle but sharply observed novel from Throsby. She has a feel for the pace and relationships of Australian country towns but delivers this understanding not strictly realistically but in a romantic, style. The mystery of the dead man does not make much sense, even when it is resolved, but allows for the telling of a fascinating true story and provides a framework around which a host of slightly eccentric characters can bounce off each other.